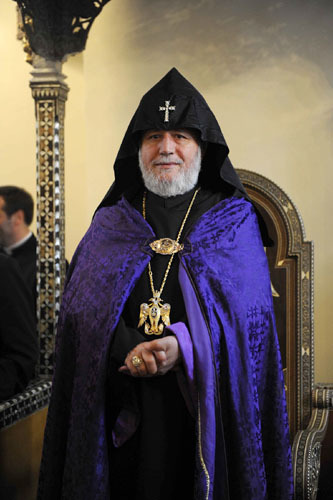 On March 24, His Holiness Karekin II, Supreme Patriarch and Catholicos of All Armenians; sent a letter of condolence to Theresa May, the Prime Minister of the United Kingdom of Great Britain and Northern Ireland, for the casualties suffered during the terrorist attacks in London on March 22. His Holiness expressed his condolences to the friendly people of the United Kingdom, the families and relatives of the victims, wishing a speedy recovery for the injured. “We strongly condemn these terrorist and extremist acts, which have no justification and is a challenge to all nations and peoples. We are confident that the compassionate UK government will do all that it can to prevent such future crimes, providing your Godly people a peaceful, secure and tranquil life. May the Heavenly Lord bless you and be supportive to the UK and your pious people”, reads the letter sent by His Holiness. This entry was posted in News and tagged Heavenly Lord, His Holiness, Northern Ireland, UK, United Kingdom by Orthodoxy Cognate PAGE. Bookmark the permalink.